Is Yoga a Religious Thing? Currently it seems that a debate is on in USA if yoga is something religious or not. May I contribute my two cents to the debate seeing that there are articles by me on the net on yoga and for yoga teachers e.g. what is yoga, Entropy yoga and in this blog on Kriya Yoga? The simple and clear answer is that there are many different types of yoga. Some are religious and some are not. The one being advocated in the USA presently and by the Lady Obama and President Obama is not religious. It is a yoga that involves primarily physical exercises and/or breathing exercises and such yogas that may go by the name of hatha yoga, pranayama as well as numerous modern names are not religious. However a yoga that involves physical exercises that includes a posture called Surya Namaskar involves worshipping the sun and it is a religious yoga. I changed my blogger profile image today to this one. 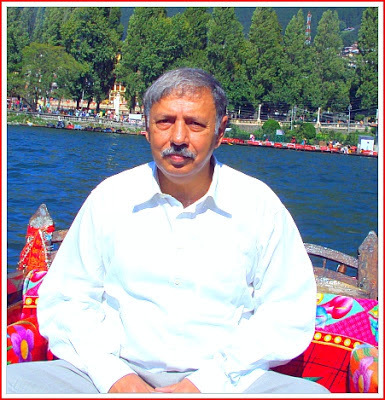 It is me on a boat on Nainital Lake. What a wonderful place ( except in the midst of winter). The central cover image of this blog shows a much larger view of the lake snapped from top of a mountain that I reached by a rope way from near this lake.The boats show as tiny dots in that photo. I used to climb up this hill by foot even at the age of four as my mother used to say, our home was half way up, but now past sixty I run out of breath in doing that. I came down the hill on foot so as to enjoy the beautiful hill side full of pine and oak but even that was not fully comfortable because although one does not run out of breath down a hill the legs, lower calf muscles, got jittery. On the way down a much- much older person was merrily walking down with the help of a stick . I guess he was in practice whereas I am not - spent far too long on the plains I am afraid, far more than necessary :) Hope Naini Mata forgives me for that.